The Super Gold award means that Wyke Farms has made it onto the ‘The World’s 55 Best Cheeses’ list and was one of only two Super Gold awards to cheddar this year. “Our family has been perfecting our cheddar for over 150 years, so to receive recognition in the form of world class status is wonderful for everyone here,” says Rich Clothier, Managing Director and third generation family member at Wyke Farms. 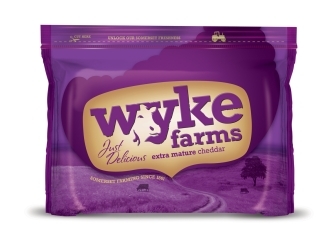 Wyke Farms has been producing its award-winning cheddar for over 150 years and has grown to become one of the largest family-owned food brands in Britain valued at over £70 million at retail (Kantar data). The company has achieved substantial growth year-on-year by staying true to the traditional values behind the brand. Wyke Farms has 150 years of family farming experience, and its cheese and butter is made with the milk from their cows grazing the lush pastures of the Mendip Hills in the centre of the Cheddar making region in Somerset. The Wyke Farms products are available nationwide and can be found in Asda, The Co-op, Makro, Sainsbury’s, Tesco and Waitrose supermarkets in the UK.